Cute ideas for decorating the kitchen. Having a romantic dinner at home? Set the mood in the kitchen to help arouse all your senses. I found this technique in a magazine years and years ago and thought it was so rustic and smart. Hang old and/or antique ladles from a long pole with S hooks or from a mantelpiece. 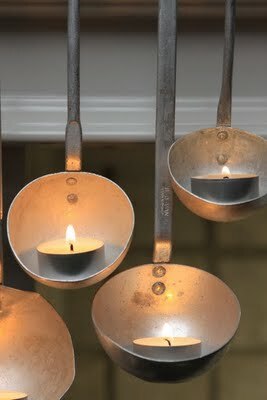 Simply place a tealight candle in the spoon to help set a soft romantic glow. This is stunning when you use more than 5 ladles. You can easily find ones of different sizes, shapes, and colors at garage sales and thrift shops. I adore lemons. I love how they smell, I love their color, I love their taste, and I love the many delicious desserts I can make with them! Regardless, I wanted to incorporate lemons into my decor. They are bright and festive and the soft lemon yellow is just the warm hue I was looking for. A few years ago I bought a set of 3 wall boxes on super sale. They were an ugly brown color and I figured I’d just buy them and repaint them. WRONG. The paint didn’t stick. So I brought out the big guns…the modge podge glue. 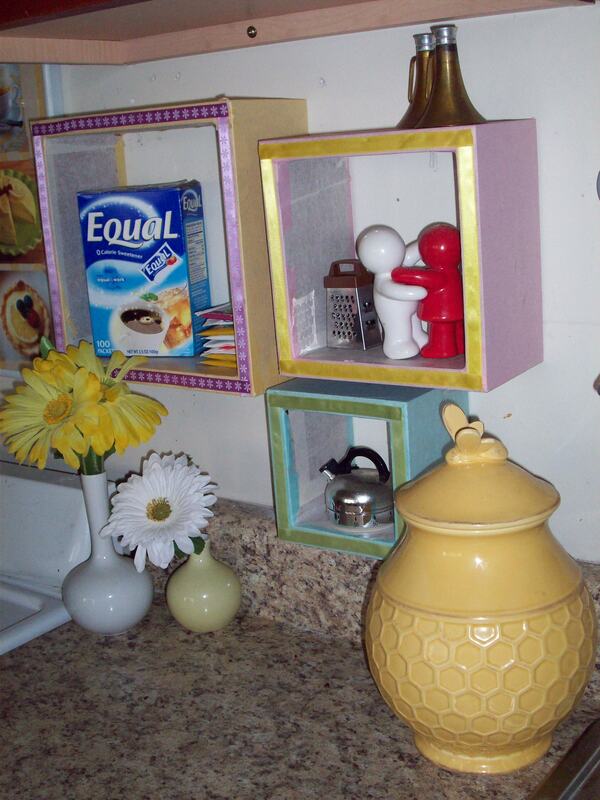 I went through my paper scraps and found 3 colors I loved and decoupaged the wood boxes and hung them above my counter. Now they hold salt and pepper shakers, the fixings for tea, and my kitchen timer instead of collecting dust in my closet. As my boxes dried, I took the three pieces of paper I used to decoupage and headed out to Crate and Barrel for some new towels. I ended up coming home with new bowls and cookie cutters. Finally, I was looking for something to “tie the whole room together”…as the Dude would say. 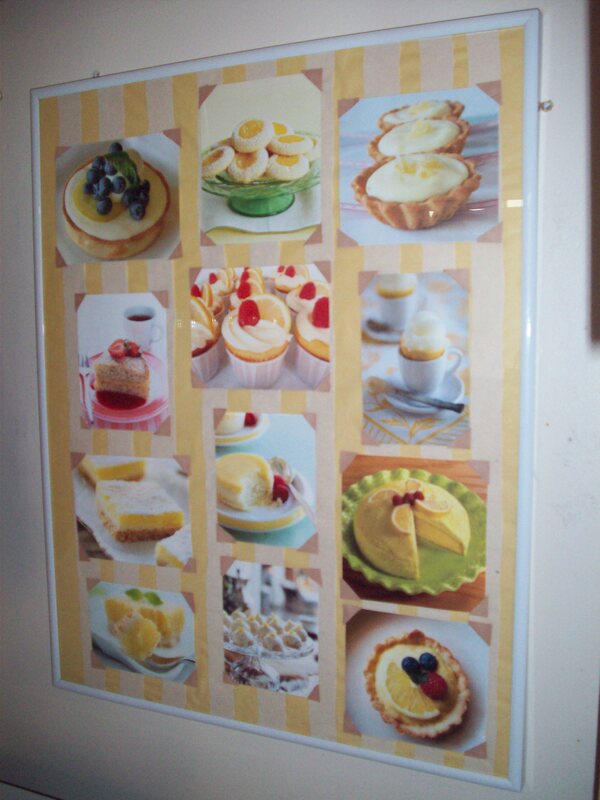 Since lemons were my inspiration, I went to Google and printed off photos of 12 delicious-looking lemon desserts. I taped them to a piece of yellow tissue paper and framed it. Tah dah! Kitchen art. This was an unbelievably easy craft day and both items only took about 1 hour each to make. The best thing about it is that you can customize it to any kitchen. And just because you live in a place with four cabinets doesn’t mean you have to deprive yourself of a kitchen face lift! So my mom and I were browsing a local shop in our “downtown” area and I stumbled upon this adorable idea for napkin storage. 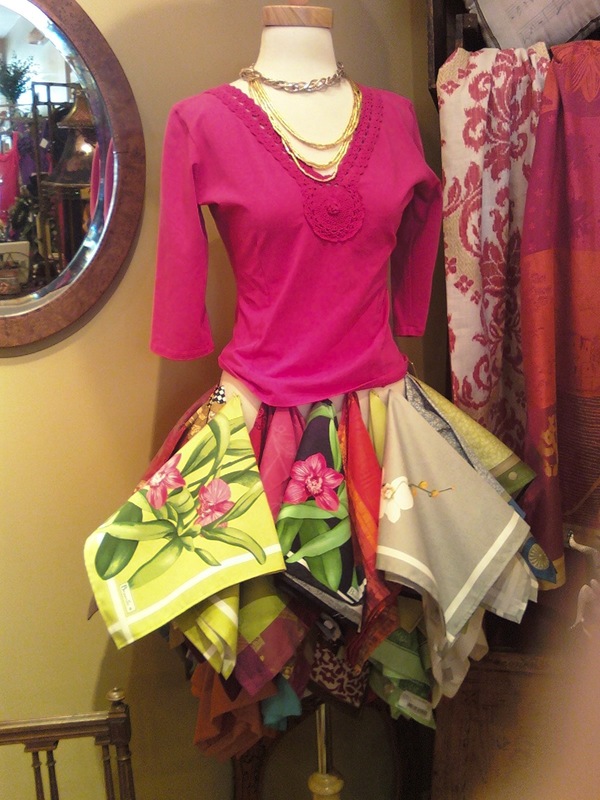 The store manager bought this clothing model at a rummage sale and simply pinned different napkins around the base to make a skirt! How cute is that? This would be adorable to do with old scarves, ribbons, and extra pieces of fabric. Make sure to use small needles so you don’t hurt the fabric in any way.